Martina had described me in details where I should wait for her. She only wrote that she was going to take a day off to spend it with me but at the same time we can do whatever I like. So we can spend the whole day home if I feel so and that was going to be good enough for her. I had no expectations towards Breclav. No idea about the city itself as well! It turned out to be pretty amazing and Martina was just a perfect host! 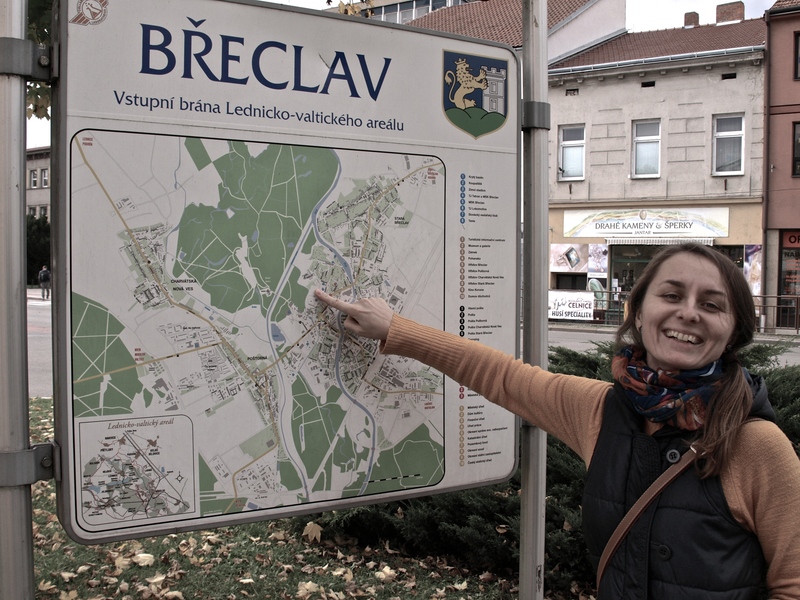 Breclav is a city located near the Austrian border with some 25 thousands inhabitants, so rather a small one. 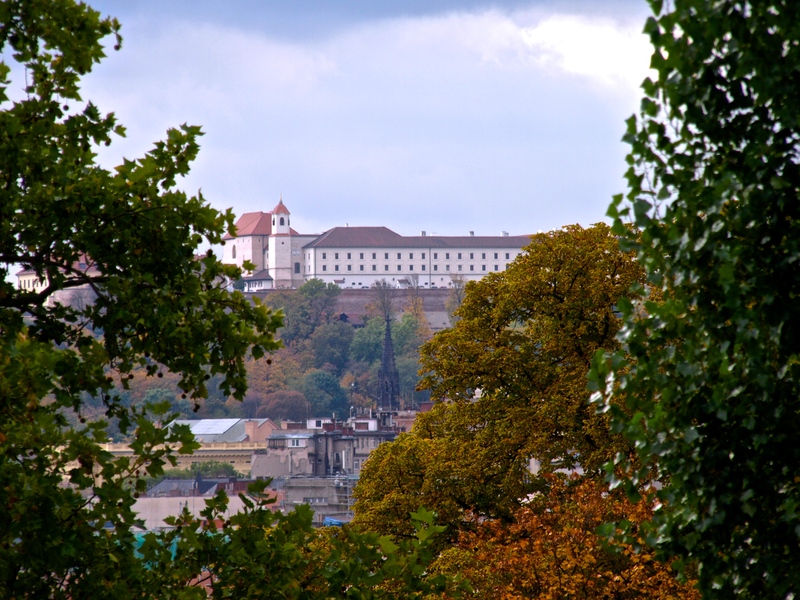 It was founded in 11th century by Břetislav I, Prince of Bohemia and that’s where the city’s name comes from. It was an easy ride. It was soo easy becasuse it was only 60 Km and I had completely flat road. Six hours and I was there! This time I was even signing loud on the road, I have to confess. And the sun was there. Yes! This is what I call a perfect ride! Brno. A city with a population of around 400 000 inhabitants. The second largest city in the Czech Republic and the biggest one in Moravia. The city which I used to travel through on a bicycle following the trams, not to get lost. The city that has bewitched me with its charming small streets and saddened me with omnipresent advertisments of everything that has made it really complicated to take a nice shot. The city, which – as my host Ladislav said – might be said to be a Czech Sillicon Valley. A city that lies nex to three rivers (includig the one underground), sits between two castles (Špilberk Castle on the hill in the city centre and Veveří Castle on the Svratka River) and has one UNESCO Heritage building (Villa Tugendhat). A city that is part of the Amber Route connecting the Baltic Sea (Gdansk) with the Mediterranean Sea (Venice). Brno. The first archeological remains suggest the origins of Brno around 5th-7th century. However the first borough was built here between 1021 and 1034 at the Petrov Hill by the king Břetislav I. Some dozens years later, another king – Přemysl Otakar II (dubbed the Iron and the Golden King) built the castle Špilberk (which I have not visited, unfortunately, but have seen from different perspectives), that became the base of the city walls. Brno became the Moravian capitol in 1641 (after the Thirty Years Wall – I wrote about it already in my article about Olomouc) and was very efficient in defending itself. The Napolean army was the first one that made it into the city and that happened only in the middle of the 19th century. And it was Napoleon himself who ordered demolishment of the city walls – as a result of it there is only one city gate left (next to which is a restaurant with delicious vegetarian food, called Rebio). Brno gained significance thanks to the development of the weave industry in the 17th century. Its position has been strenghtened during the interwar period by the weapon factory and the massive weapon production (the second one was in Pilzen) that made the Czechoslovakia a world potentate. It’s also worth to know that the city and the airport have been twice bombarded during the World War II (in 1944) – in contrary to the common knowledge that the Czech Republic has not experienced any warfare. Luckily, the most important monuments remained untouched. There is also a sad card in Brno’s history – after the war ended, the city government forced around 20-25 thousands German inhabitants of the city to leave their houses during one night, not giving a permission to take anything with. It’s estimated that at least few hundreds people died when marching toward the Austrian border. 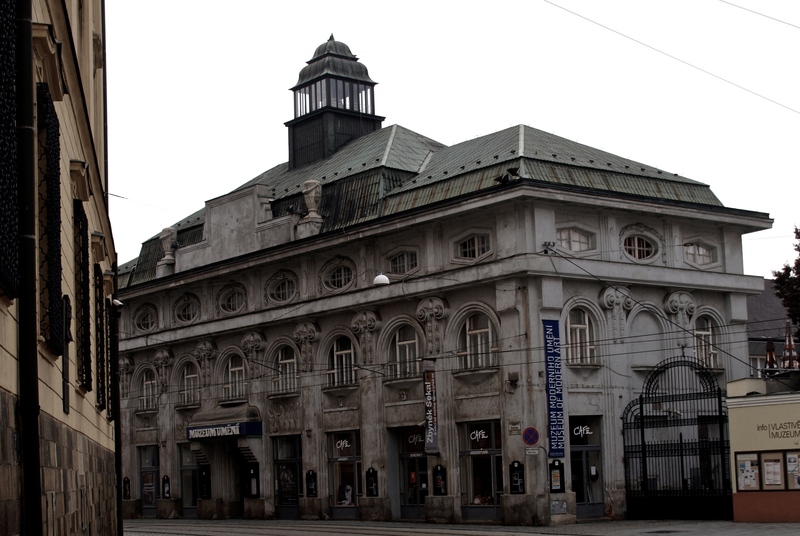 Mahen Theater is Brno’s city theater and the first one – at the same time – that has been electrified in the continental Europe. The installation design was created by Thomas Edison himself! A very interesting exhibition of two brothers-artists – Dalibor and Ivan Chartny – has been presented at the Brno House of Art. Most of the space was occupied by the artworks of the first of them and was called “I Am Space”. All Ivan’s artworks presented were gathered in one small room at the ground floor. I liked the exhibition a lot, so I’m going to write a separate article about it, with no photos however (sad, I know! ), becasue I had to sign the special paper at the entrance that allowed me to take photos but forbids me to publish them anywhere (so I can show them to you once we meet in person!). 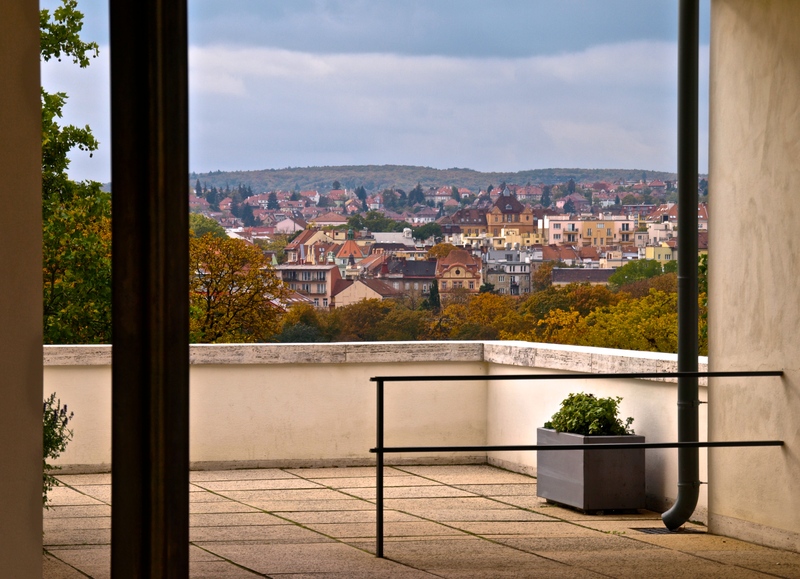 There is this very unique building in Brno called Villa Tugendhat, constructed in 1929-1930 by German architect Ludwig Mies van der Rohe for Fritz Tugendhat and his wife – a symbol of the modernist architecture. Unfortunately I didn’t have a chance to see it inside as the tickets have been booked by.. mid-December! Despite that I went for a walk to see the building from the outside at least (not much to see as you can only see the back of it) but I have to admit at least that the terrace view from the villa is quite stunning! Trams in Brno are going in all directions possible (and you need to remember to watch carefully the directions they are going to and from when cycling around the city – as they will appear from all sides possible; on the other hand it’s also helpful to follow them in case you don’t really know the direction but you know tram stop’s name!). The first – horse- trams appeared on Brno’s street already in 1869 and they were substituted for the first steam trams some 15 years later. 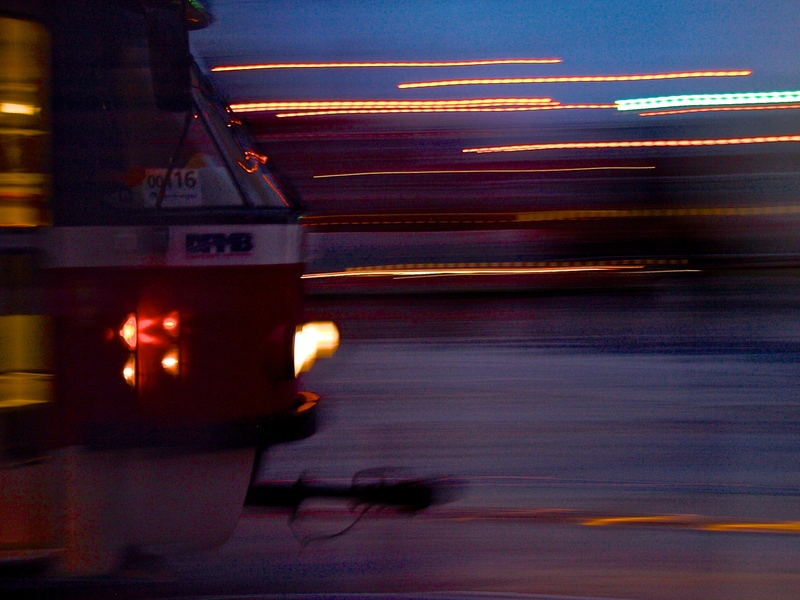 The tram network has been electrified in 1900. The writers Milan Kundera and Bohumil Hrabal were born in Brno. Gregor Mendel – a monk and an abbot of a German speaking family origin, living in the 19th century, that is regarded to be a father of the genetics (yes yes, biology classes, high school, Mendels laws – THIS Mendel) has done his research and discoveries in Brno. There is a museum of that documents his life and work and a part of the university has been named after him. My friend Ula that has spent quite a while in Brno gave me several recommendations: the best beer and the coolest atmosphere is in the bar Na Stojaka and in the neighbouring bar, ktery neexistuje. The best wine and chocolate cake you will find in Café Tungsram (next to Zalniho Trh and The Capuchin Crypt). Bistros you should visit are: Franz, Soul and Cattani. Well, and you have to visit the rum bar Zona 59 at tke Kounicova St. Now, this is what I call a good recommendations! I have not managed to visit the places myself (maily due to lack of time) but if only I will make it to Brno once again, I will know already where to go! Thank you, Ula! Here are some glimpses from Brno – enjoy! Trams and trolley buses network! They were getting ready for Christmas in Brno already in mid-October! 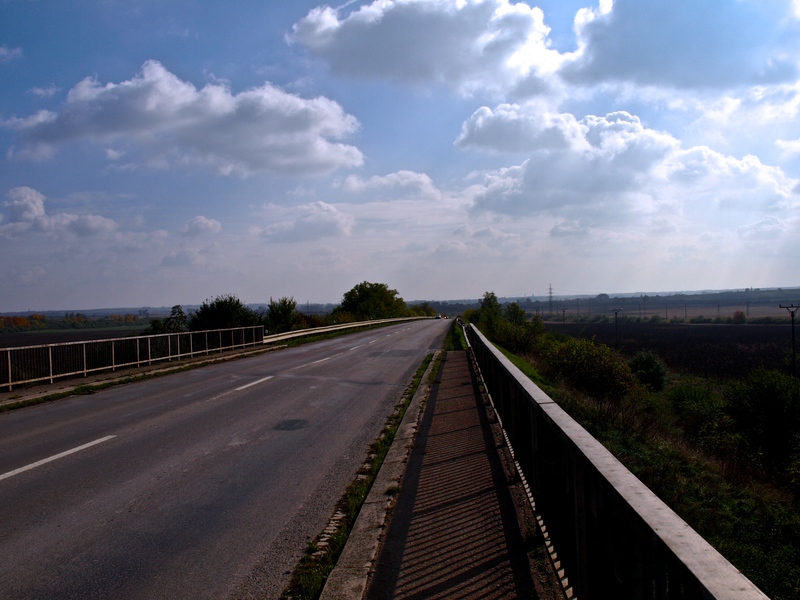 The road from Olomouc to Brno was not really pampering me with all the hills and constant ups and downs. The brakes were gone at the end of the day, so I had to take the bike to the service the day after. Additionally at the very beginning I lost all my notes that indicated how to reach my destination. That meant that for the very first time I was riding with the map only (and although I was quite scared at the beginning, I eventually managed to do it!). Unfortunately it looks like it was the day that started the series of the lost items. Well, actually it started already on the way to Olomouc, so three days earlier (I lost my cycling googles back then, but didn’t know how that happened). The sheets of papers with the clues were the second lost thing.. The situation developed in the following days. 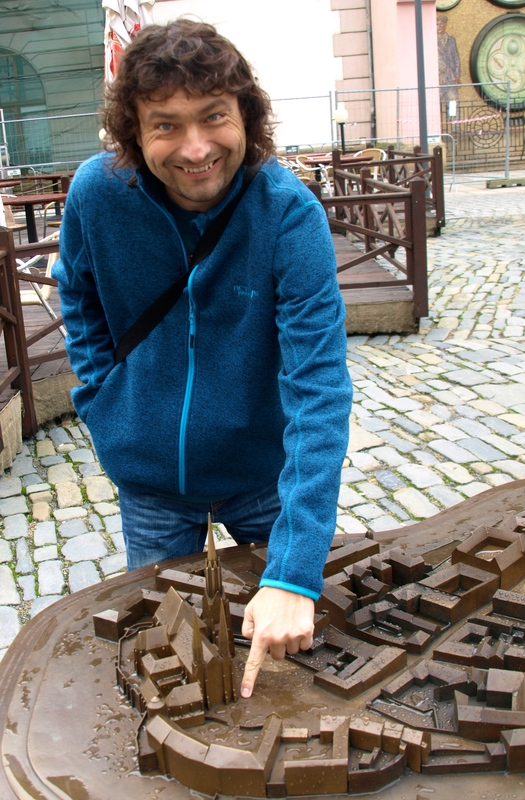 So when I eventually reached Brno, I was totally lost in the city (having no clues, no citymap, no navigation and.. no address of my hosts – Jana & Ladislav!). Which is why reaching the destination (since the moment I passed the border of Brno) took me some additional.. four hours! Well… Let’s say – another lesson learnt! An old, beautiful, Czech city that has its origins somewhere in 11th century. At the same time, for me it was the first Czech city I have really visited during this trip, because in Ostrava I have only arrived in the evening, played darts with Vitek and Vladia afterwards and left to Olomouc the following morning. Jiri has organized my whole stay in Olomouc – since Friday evening when I have arrived until Monday morning, when I have left. Dinner, sightseeing, lunch, shopping, a walk across the parks, visits to museums, meeting with the school kids – everything was planed! Thank you, Jiri! I would have probably never seen and experienced so much myself! It was also a very interesting experience becasue I slept in a school which meant – an empty school during the weekend. I was there completely on my own, also during the night time. Have you ever been in a school in a night time? It actually happened to me already but never alone the whole night. Empty corridors all around, you can call “eeeeecho!” and it will resonate, many shadows here and there. No, I have not done that. I was sitting politely and quietly in my room, situated between the school kitchen and a bathroom with a huge bath (now this is something I would have never expected to see in a school!). I was not on my own there however – together with me in the room there were five training bicycles, four scooters, two bicycles for kids and few training mattresses. Olomouc is a city that sleeps during the weekend. I don’t know if (or how) it’s different during the week days but during the weekend it reminded a ghost town a bit, not a ruined and scary one, rather a very beautiful type. It recalled also my visit to Petra in Jordan, currently quite an empty (in tourists) place as well. We walked a lot with Jiri around Olomouc, stopping from time to time in one of many coffee shops. Jiri said that there is so many of them because there are 20 thousands students in Olomouc and I started to wonder wheter coffee shops are really meant mainly for students as I still love to go to the coffee shops myself even though I have not been a student for quite a while. The one where I’ve spent most of my time in Olomouc was Cafe 87, located in the same building as the Museum of Modern Art – check it out if you were looking for a good coffee and a good muffin! The main tourist attaractions in Olomouc are the Holy Trinity Column – the only UNESCO heritage in the city and the astronomical clock – one of two in the Czech Republic (the second one is in Prague). I have to also admit that I was really impressed by the murales – a few of which I had a chance to see while walking around the city. What impressed me the most, however, was the exhibition of Zbynek Sekal titeled “Things Are Moving Forward Slowly”, which I’m going to write a separate post about soon. Olomouc is a historical capitol of Moravia (which I have fell in love with) and the main city of the Haná region (which pronounces wiht a long “a” – the one I have not heard since being back to Europe from Israel; I know, it’s the second time I’m mentioning Middle East here, which probably means that I quite miss it). The first references to Olomouc are from the 11th century and 150 years later the city became Moravian capitol and kept the role until the mid-17th century (that is until the end of the Thirty Years’ War) when Brno took it over and never gave back. It is however here, in Olomuc, where the second largest monuments complex in the Czech Republic is located. 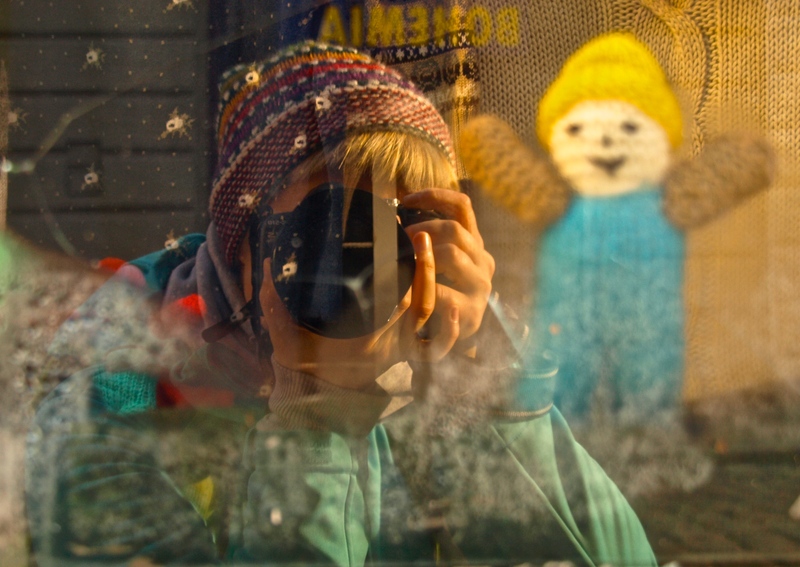 I have been gadding about the town, with Jiri, with Andrea and Dana – another two teachers, and also quite a lot of time on my own with a camera only. As already mentioned the main surprise for me was the Museum itself and two exhibitions presented the moment I visited – of Zbynek Sekal and the second one about the Polish-Czech design of 60s. Such art attractions made me really very postively surprised! Superb!! Congratulations, Olomouc! It was supposed to rain the whole day. It did maybe for one hour during my whole 10-hours long ride – I’ve been really blessed with the weather! The route brought a lot of amazing moments as well. Especially when I have already left industrial and not that friendly Ostrava and entered Moravia. Those views! The moment is exactly now when the tress start to be as colorful as the rainbow. So if you are in a place where there are innumerable trees, you really don’t know where to look at (becasue the road is too boaring to look at 😉 ). Everywhere around has been so beautiful! 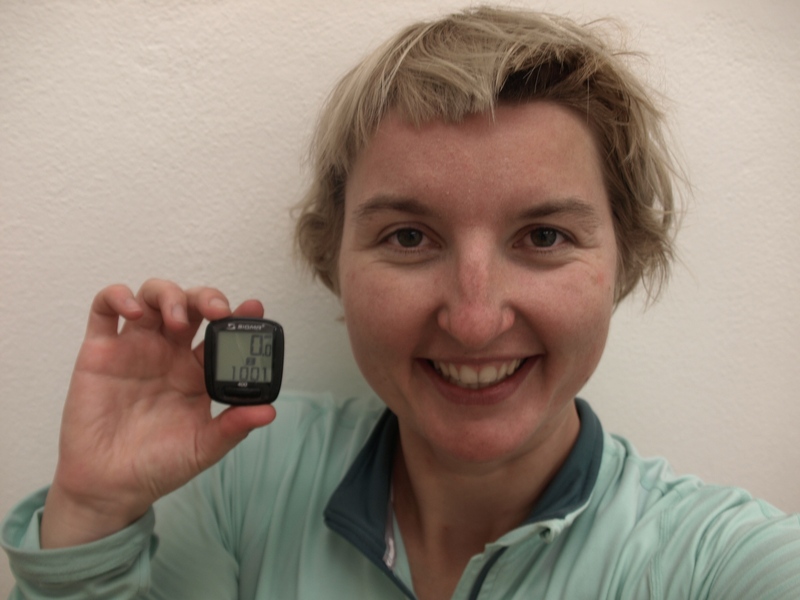 But I have not expected that the ride will be 100 Km long – Google Maps have been optimistic again when told me that it was going to be 90 K. Well, I eventually did 105. But quite unexpectedly the biggest crisis came around 30th K that is much earlier than expected and it was this moment when I was wondering if there are some buses or trains on my way because I will probably not make another 70 K.
I left Ostrava without breakfast. I only ate a banana and drank a tea and decided that I will stop on the way to buy something for breakfast. The first shop appeared, however, only after some 20 K and 1,5 hour after I departured, so I’ve been really hungry already. I bought some pastry with appricot marmolade and small packet juice. I ate also a grasp of nuts and few pieces of a chocolate. The coolest thing, however, was that it was back then when the sun appeared on the sky and I decided to change my bike gloves into the pink ones! So much of happiness! I thought that maybe it was not going to be such a bad day (a naive me!). Peggy in the sun, sun, sun! The next 15 Kilometers was THE WORST! 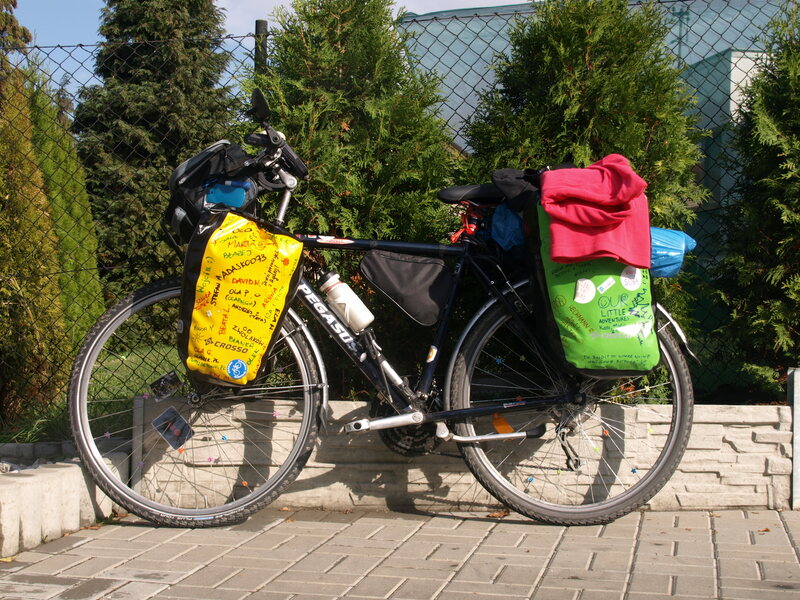 The first time since I left Warsaw I had to carry my bike becasue it was too steep to ride it. And so steep that I had to stop halfway becasue I wasn’t able to carry on. So when I made another stop I really had no energy anymore. I sat down at the bus stop, took the cocoa cookies and I kept wondering what to do now. It was 1.30, I had only rode 35 K and I was exhausted. Unexpectedly the elderly Czech woman joined me. She had advised me to ride my bike to Olomouc along the highway “becasue it’s easier and more comfortable” and she was really surprised when I told her that I’m actually not allowed to ride a bike on a highway. She shrugged and started telling me the story of her three kids and five grandkids.. “Time to go!” – I thought. And this is how the decision to carry on was made, I guess. The beautiful downhills started right after then (the uphills as well). So somehowe I did another 15 K and when I reached my 50th K I felt a new shot in the arm. I knew that half of the way was gone and luckily I wasn’t aware how the other half was going to look like! I was standing in front of the forest and I couldn’t take my eyes of it. I ate some sesame crackers, a bit of chocolate (again! Which reminds me of a Tegan’s story, the one really close to my heart.. and my body as well! I mean expecially the PPPSSPS) and I started pedalling again! 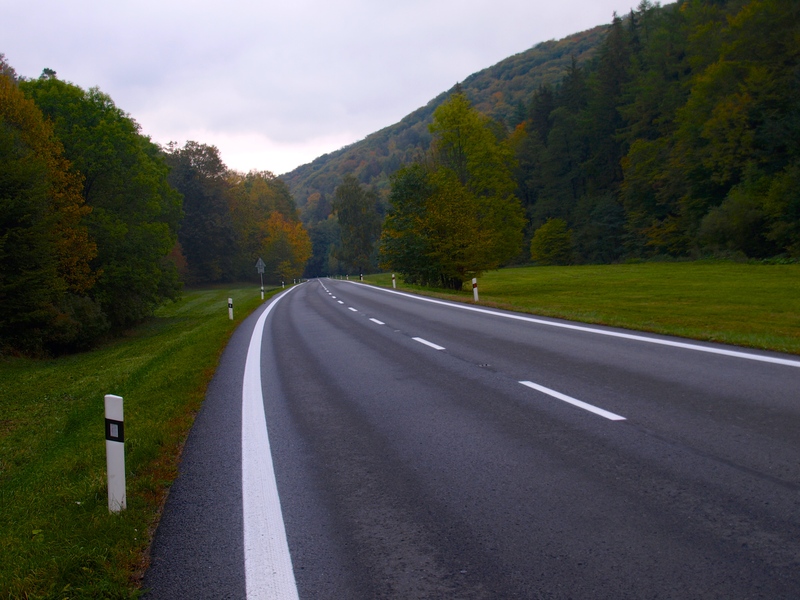 Moravia: On the way from Ostrava to Olomouc – doesn’t look that steep right? Hey Moravia! Quite amazing views, huh? 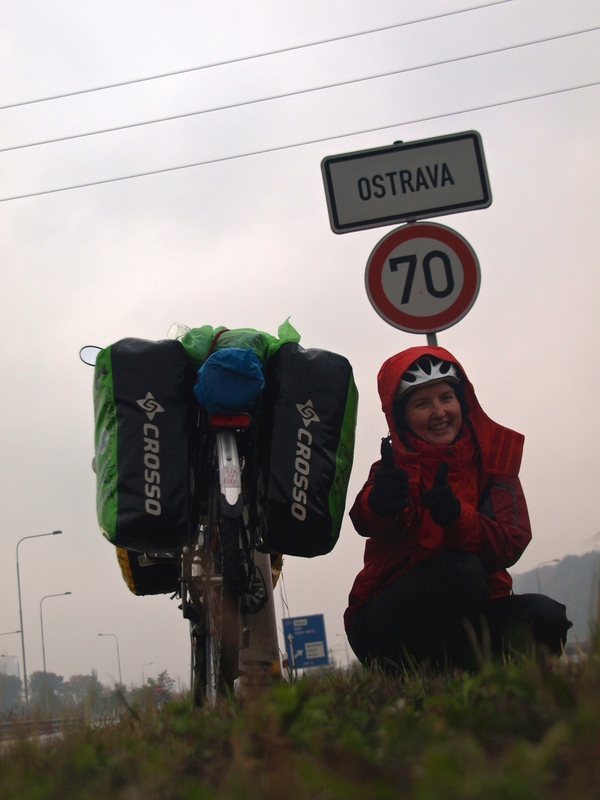 Moravia: On the way from Ostrava to Olomouc – well, it was steep, I’m tellin ya! Whou would expect a 7-Kilometers-long uphill just ahead of me? Well, it wasn’t me! Luckily it was not that steep so I was able to keep riding becasue after I had to carry the bike a couple of times in the last 50 K, I had grazed legs. And so was the next 30 K. Most of the rode was up and up and up the hill.. But those forest! For me only! I was totally on my own, the cars were bypassing really rarely, so all the views were mine! It started raining eventually around 60th Kilometer, so I stopped, dressed all my rain clothes and kept riding. And do you know this feeling when you are riding up the hill most of the time and then sudeently you see a sign with a big truck on it and the inscription: “Attention! (Pozor!) The 10% downhill for the next 7 Kilometers”. I opened my eyes wide, stopped bicycle to read it again. Yes, that was it! 7 Kilometers ahead of me was the downhill only! Whoooow! That is what I call a superspeed! When I finished I saw another plate: Olomouc 13 Km. I already knew I was going to make it. Another shot in the arm – what is 13 kilometers? Nothing! Hey Olomouc! See you very soon! Jiri – a Czech friend of my father had picked me up in Velka Bystrice and led the last part of my way to Olomouc. The off-road was a bit challenging I have to admit, becasue riding my bike in the forest after the rain in the night time without a proper lights, well.. But I have managed! I reached Olomouc eventually around 8 pm and I was extremely happy I could already take off all my wet clothes. It was definitely the most difficult ride. And I have to admit I felt proud of myself that I managed it. As an award I took a really really long bath afterward! Ps. When was the last time YOU did something for the first time?